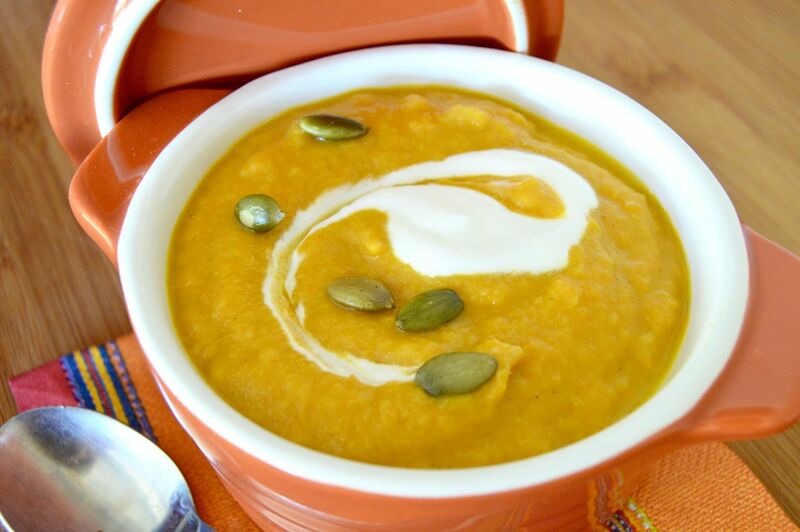 A tweak on a traditional soup, this Ginger Sweet Potato Carrot Soup hits on all flavor senses. A little bit tropical with the Ginger and Coconut Milk, but the soup is ALL comfort with the sweet potatoes and carrots. Perfect soup to make ahead and bring to a potluck, work meeting or to serve lunch with a friend at home! I love soup. 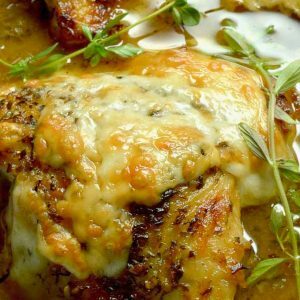 Its super easy and always is a comfort food to me. This Ginger Sweet Potato Carrot Soup is no exception. 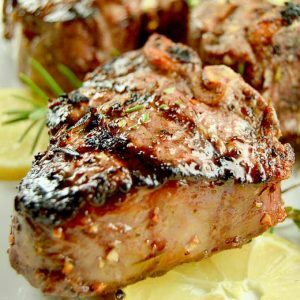 This recipe is inspired by one originally found in Cooking Light Magazine, I tried to link to it for you but they no longer have it on their site. This soup is packed full of flavor and then pureed to a velvety consistency. 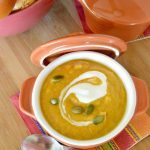 Ginger Sweet Potato Carrot soup has some unique ingredients: it uses garbanzo beans along with sweet potatoes and carrots so it is packed with nutrient rich ingredients. I added some coconut milk to make it a little creamier than using all vegetable broth (or Chicken broth.) The coconut milk pairs well with amount of ginger, lending a tropical note to the soup. Soup is a great social occasion food. You can make it ahead and pack it easily for transport. 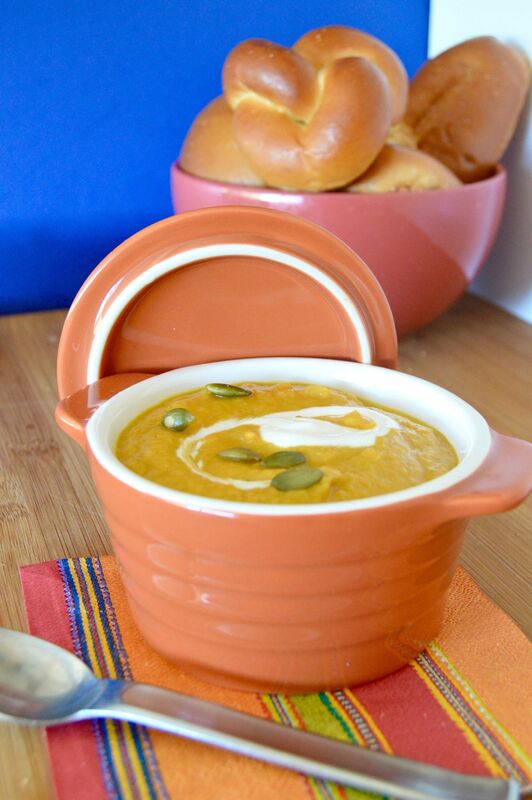 Ginger Sweet Potato Carrot soup can be served in small lidded containers like these pictured here from Sur La Table. Another option? You can place the soup in a thermos , take it to a work potluck and serve it in small plastic cups. The thermos will keep the soup hot, but the small cups are great for serving many people. SPECIAL EQUIPMENT: To make this soup, I use an immersion blender like the one shown here on Amazon. You could substitute a blender or a food processor if you don’t have an immersion blender.. The only thing I would suggest is that if you use either of the substitutions listed that you do them in small batches. The immersion blender allows you to puree the soup right in the pot that you cooked with. The special tip I have for the immersion blender is to make sure that the soup completely covers the head of the blender, or you can have soup sprayed all over. Make Ahead? Freezable: Absolutely. I usually make Ginger Sweet Potato Carrot Soup the night before a football party and then rewarm it when I’m ready to serve it. If you want to freeze it, I suggest you freeze in in single serve containers so you can defrost it as you are ready to enjoy. Special Topping Ideas: I topped it with Pepita’s (aka pumpkin seeds.) (pictured) I like the salted ones a little better for an added flavor boost. You can also swirl a little sour cream on the top (also pictured.) Not shown, are home made croutons (link here for my recipe) or grate some fresh parmesan cheese over the top. 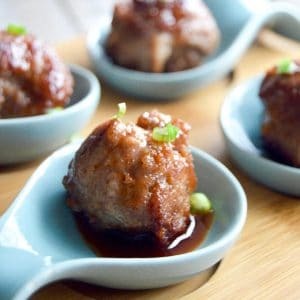 Social Occasions this is perfect for: Work potluck, Luncheon for someone joining you at home. Football Watching party (Meatless option for serving along side these Baked Wings! Cocktail option: Any Crisp White Wine or bubbly. A tweak on a traditional soup, this Ginger Sweet Potato Carrot Soup hits on all flavor senses. A little bit tropical with the Ginger and Coconut Milk, but ALL comfort with the sweet potatoes and carrots. Perfect soup to make ahead and bring to a potluck, work meeting or to serve lunch with a friend at home! Heat a large stockpot to high, once hot, add the olive oil then wait 30 seconds and add Onion, and cook until translucent, about 7 minutes. Add garlic, ginger, cumin, cayenne, and Curry powder and stir for 1 minute. Add sweet potato, garbanzo beans and carrots and stir to coat with spice mixture. Add Broth, coconut milk and salt, bring to a boil. Once at a boil, reduce heat to medium high and simmer for 30-40 minutes until carrots and sweet potatoes are cooked through. Remove from Heat. Remove one cup of broth and set aside. Using an immersion blender puree soup completely. The reserved liquid is only necessary if you feel the soup is too thick. It is your option whether to add any or all of the broth after pureeing the soup. Finally---Add lemon juice and stir. The lemon juice is to brighten the flavor a little bit. 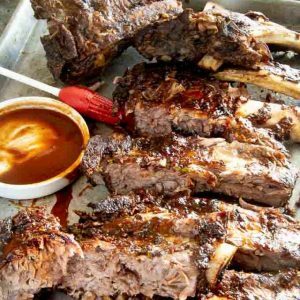 Either serve immediately with any optional toppings, or allow to completely cool before storing in sealed containers to save until ready to serve. Freezing in individual containers makes it nice to pull out and defrost as you wish to enjoy. Just made soup! It is great but when do I use lemon juice? This looks and sounds delish. Silly question tho, does # mean pounds (sweet potato and carrots). Don’t want to assume. We love soups to take in the RV when we hit the road. Looking forward to trying this out! This has become my 7 year olds favorite soup! I can’t believe she is eating all these vegetables and begging me to make it ALL THE TIME! THanks ! Sounds wonderful! In putting together a shopping list I notice you mention garbanzo beans in the intro and the directions, but not in the ingredients list. Could you fill in that missing bit of information please? This looks and sounds so good Michele! precisely what my daughter loves. Must remember to make your version next time. 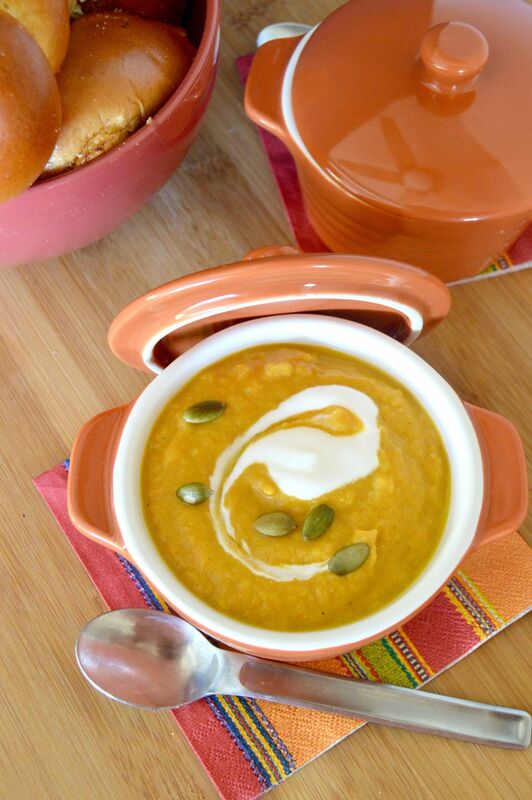 Such a terrific fall soup—from the ginger addition to the sour cream swirl to the pepitas! This sounds so good–and perfect for a cool fall day. I’m adding this to my list of soups to try soon! If you are like we are, it will soon become a regular in your soup rotation! This looks so creamy and delicious. And the fact that it’s easy makes it even better! Oh my gosh I am so excited for fall (it is my favorite season) and this soup is the perfect welcome to it! Lovely flavor combinations, Michele! Those rolls in the background also look amazing;) Looking forward to soup season soon! I love a good comfort soup – like LOVE!! Can’t wait to try this one!! Looks yummy and the fall season is upon us! This looks absolutely delicious! As soon as the weather starts to cool down around here, I’m putting this on my menu plan.